Here you will find past KREHA News stories transferred from the Home page. They are listed below with the most recent at the top of the page. >The election results from the May 2015 annual meeting was as follows: Rob Potter, President; Rich Larson, VP; Don Elliott, Secretary; Cindy Hemphill, Treasurer; Assessment Committee, Greg Baer, Jim Gough, Gary Lester; DRC, Chuck Alley, Kyle Rohrbaugh, Steve Willer. On March 9th, Lynda Filson resigned from the Assessment Committee. Greg Baer agreed to take her position on the committee until the next election in May. On January 20th, 2015 there were 24 street catch basins cleaned which completed our annual storm drain system maintenance cycle. A few months ago we had the retention ponds cleared of brush and floating debris. We are good to go for another year. For the next few years we are going to inspect 100% of our catch basins so that we can develop a fill rate plan for each catch basin and a corresponding cost effective annual cleaning schedule. The board is holding a Block Party Barbeque for KREHA members on September 28th on 50th Street Court from 2 to 4:30 pm. Come out and meet your neighbors. The board members will be doing the cooking. Read all about it right here. The election results from the June 25th, 2014 annual meeting was as follows: Rob Potter, President; Rich Larson, VP; Don Elliott, Secretary; Cindy Hemphill, Treasurer; Assessment Committee, Lynda Filson, Jim Gough, Gary Lester; DRC, Chuck Alley, Rob Potter, Steve Willer. Greg Baer resigned as President in March of 2013 to free up some time so he could get involved in a new volunteer opportunity. Kim Henson resigned her post as Vice President. Their house is on the market and they expect to be moving in the next few months. Sharman Keely, volunteered to take on the role and the Assessment Committee apointed her to the position on August 18th. In case you haven't heard, there was a bear in the neighborhood in October 2011 and he/she was captured by State Fish & Wildlife. They used a large trap with donuts inside. They took the bear to a far away happy place. They let the few Sherriffs go so they could find more donuts. If your log-on to the Members Only area is not working, go to the Members Page. Access to the Members Only area of the web site went through a major change earlier in 2010. There were about 20 non-board members present at the annual meeting and election on May 16th 2012. Regarding the election, a motion was made and seconded to accept the slate of officers endorsed by the Assessment Committee and the motion passed without objection. The slate included all the incumbants except for the Teasurer position which is now held by Cindy Hemphill who has replaced the outgoing Treasurer Patricia Souza. Patricia decided to reduce her volunteer activities so she can give more attention to her new postion with Multicare in Tacoma. There is a new version of the roster dated November 11, 2011 in the members only area of the web site. Our automated messenging system went through a major overhaul thanks to Don Elliott who has taken over the administration of it. He made some changes that will make it easier to use and allow us to get a little more use out of it. Thanks Don!! While Don was working on making some changes to the automated messenging system, he also put together a terrific Security Alert Notice for our Members explaining options to follow in the event of a security problem and how they can get word to one of the Board Members in order to get an alert out on our messenging system. It will go out in the mail along with a new roster this week. The annual homeowners meeting is scheduled for May 11, 2011. Come on out and meet some of your neighbors and vote for officers. Proxy forms may be used to cast a vote for absent members. The proxy forms are right here. There is a new version of the roster dated March 5, 2011 in the members only area of the web site. At the last Homeowners Association Board meeting, Kim Henson and Steve Willer volunteered to take the lead in organizing a Neighborhood Watch program. To kick it off, they have organized a meeting with Pierce County Sheriff Emily Watson, Education and Community Service Officer. She will give a presentation and lead a discussion and answer questions. The meeting will be held Thursday April 7th at 6:30 pm at the Arletta Fire Station. Here is a flyer for the meeting. Join us and bring a neighbor! A copy of the revised By-Laws as a result of the meeting held in October 2010 is now available in the Docs section of the web site. Incorporating the changes, required that the original document be converted into digital format and then carefully proof read by several volunteers to ensure accuracy before incorporating the changes. We added the KREHA logo and a record of changes. If you notice any errors, please contact a member of the board. The messaging system list of phone numbers and email addresses was updated in November 2010. I discovered that there were a few phone numbers that have not been receiving the calls either due to the individuals opting out or some other unknown reason. To make sure that everyone is getting the calls, I put these numbers back into the call list. If you don't want to be included in these calls, please send me an email and I will take you off the list. A bear attacked a woman that was walking her dog on 78th just a mile away from our development on Sunday, Nov 8 at about 8AM. The dog bolted after the bear and the woman ended up between the dog and the bear and the bear came after her. She was clawed and bitten by the bear. The State Fish and Game Department has set traps to catch the bear. Please be on the lookout and watch your small children and pets closely. There was a break-in on 98th Ave Ct NW on Wednesday November 3 at about 1:30 in the afternoon. The burglars kicked in the back door off of the patio. They were interrupted by the resident coming into the house for a brief time and then leaving. It is believed that the burglars then left after going through the bedrooms looking for cash. Keep your doors locked and be on the lookout for suspicious people in the neighborhood. Call 911 if you see anyone hanging around your house or your neighbors house that you don't recognize. Report anything that looks out of place to Kim Henson or Linda Gough. They are compiling information regarding this case and have discovered that there have been several sightings over the last few months of suspicious activity in our development. We are considering organizing Neighborhood Watch. If you are interested, please contact either Linda Gough or Kim Henson. The roster of members was updated on Oct 22, 2010. You will find it in the members only section under Docs on the menu. On October 13th, 2010 a Special Meeting was held to vote on changes to the By-Laws. All but one of the proposed changes were approved by 2/3 of those in attendance plus proxies. A new copy of the By-Laws with the changes incorporated is in work and will be mailed out to all members soon. The fuel tank for our back up generator on the water system was filled on Nov 2, 2010. So, if we have a big storm and lose power for an extended time, your water service will not be interrupted. By the way, if you ever hear an alarm coming from the water system, please contact Greg Baer or call Pen Light right away. Mark your calendars for October 13th at 7pm. We are holding a combination Special meeting and regular Board meeting. The Special meeting is for the purpose of voting on proposed changes to the By-Laws. You can see the proposed changes in the Docs section of the web site. Just scroll down to 2010 Proposed Changes to By-Laws. The web site was down for a few weeks at the end of July to make a few changes in web site security and to add a privacy statement. As a result all members must re-register to obtain access to the Members area of the web site after which you will receive a new user name and password. There is a new roster dated July 29, 2010 in the Members area under Docs. A board meeting was held on July 14th. The minutes are posted in the Members Only section of the web site. A new version of the members roster was posted on 4/30/2010. It also contains some new emergency numbers you may find useful including numbers for the reporting oil spills. Also, the OneCallNow roster of phone numbers and email addresses that is used by our automated phone/email message system was updated with the information from this new roster. If you would like to add more phone numbers or email addresses so you make sure that you receive any emergency or other notices from this system, fill out a new Contact Info form and the changes will be made. The ivy tug-of-war event at Kopachuck State Park was well attended by more than 40 enthusiastic energetic participants. We filled 2 big trucks with heaps of the stuff! In between rain bursts and sun breaks, you could hear everyone working together and having a great time. Afterward, POP provided a complimentary hot dot lunch for our volunteers - complete with fresh apples and home baked cookies from our POP board members. The Arletta store is under old management. Bob and Becky Iverson have taken it over again and are asking for input from the community as to the type and brand of items that folks would like available at the store. Here is a questionnaire that they would like anyone interested to fill out to give them an idea of what the community would like them to carry. The phone messaging system has been upgraded to include email messaging and will now support unlimited calls. You probably received a phone call or two over the last couple of months from this automated messaging system. A section in our website called Msg Sys will tell you all about it. Also, the Contact Information page has been updated to collect up to six phone numbers and five email addresses for each household for use by this system. You may also opt out if you wish. You can hear the latest message by clicking on the OneCallNow banner near the top of this page or on the Msg Sys page. You can also hear the latest message by calling 877-698-3261 or 866-321-4255. There has been another change in the KREHA Board. On April 16th John Turner resigned from the DRC. Steve Willer was appointed to take his place on April 17th. It�s that time of year again when we have the opportunity to help our Rangers enhance Kopachuck State Park by removing an invasive plant � English Ivy. This year�s event will be just like last year � when we filled two big dump trucks. Kids, families and neighbors had a great time at the Kopachuck State Park �IVY PULL� to show their appreciation for our beautiful State Park. Here is a flyer with all the specifics about the event. Come on out and don't forget to bring your gloves. On Feburary 2nd 2010, the Assessment Committee held a meeting where Dave Gordon resigned and Greg Baer was appointed to the Assessment Committee to fill in for him until the next election in May. Look for the minutes from this meeting in the Members area of the web site. The next board meeting will be held on April 28th. The location is not yet known. We are hoping that we will be able to once again use the meeting room at the Arletta Fire Station thanks to the efforts of Jerry Gibbs. Jerry attended a meeting of the District 5 Fire Commissioners and made a case for re-opening the fire station for community meetings. Based on Jerry's presentation and the subsequent discussion, the Commissioners realized they made a hasty decsion before and have decided to draw up a new useage policy. We will either meet at the fire station or the Boys and Girls Club. There is a new roster (dated 9/7/09) in the Members Only area under the Docs section. Ever wonder what our soil chemistry is like in our area. Take a look at this Soil Sample Test Report. Gary Lester had some soil tested from around his home in the summer of 2009 because he had several plants die. Access to the Members Only area of the web site was changed May 15, 2009. Please fill out the Contact Information form again so we can make sure we have your latest information and include any email addresses and phone numbers that you would like to be used for the messaging system (Read about it below). The new username and password info will be sent to you after we get your updated contact info. On Saturday, April 18th, there was a report of a dead dear that was killed by predatory animal(s) and a few pets have gone missing as well. Please be on the lookout. 105th Ave Ct has been re-paved and a speed bump was installed. This completes the last phase of the road maintenance project we started a few years ago. Work has been completed on our mail box kiosks and road signs. On March 6, Jerry Gibbs, KREHA President, resigned for personal reasons. The Assessment Committee appointed Greg Baer to assume the role of President until the election of new officers in May. Jerry will still be involved on the sidelines to help us along. We are forever grateful for Jerry's many years of service to KREHA. You surely are aware that Kopachuck State Park is on the closure list and that some of your neighbors have joined and formed a group called Preserve Our Park (POP). Visit their web site at www.pop.kreha.org. They could use your help. The annual members meeting was held on Wednesday, May 28th. You can read about the meeting including the election results in the Members Only area of the web site. You have probably seen the deer around that has some rather gross looking growths hanging from its chest and underside. Some of our homeowners have been concerned about this deer so our President, Jerry Gibbs, contacted the Game Department and sent them a picture of the deer. They wrote back with an assessment that the growths are from a virus and if the deer stays healthy, it will lose the growths and heal. Here is the letter from the Game Department. *** WATER SYSTEM - NEW BOOSTER PUMP UPDATE, May 30 *** The New Booster pump system was cut in this morning. Everything is working properly. Division 1 homes should now experience very consistent water pressure. The Sagers reported on March 14th that they saw some coyotes on their property. You might want to keep your small pets in the house. PenMet Parks will hold the third in a series of public workshops seeking comments for the development of a park on 20 acres adjacent to and east of Voyager Elementary School. The meeting starts at 7:00 pm, on Tuesday, March 4th at the Kopachuck Middle School Commons. If you would like to attend please RSVP to Eric Guenther at eguenther@PenMetParks.org. There is a new version of the roster dated 2-7-08 available in the Members Only area of the web site. A regularly scheduled board meeting was held February 7th. Look for the minutes in the Members Only area in a week or so. The State approved the Kopachuck Ridge Water District plan to install a new booster pump system to provide a more constant flow and improved reliability to the homes in Division 2. Construction of the new pump house has completed. Plumbing work is starting. The change over is currently scheduled in the last week of this month. The entire system will be down for a short time (4 hours or so) while the new system is connected. Notification of the planned outage will be sent out to all residents. You can read more about this plan on the Water section in the Members Only area of the web site. I received an email from a friend of mine in Ketchikan and I would like to share it with you all. Please read it an pass it on. If you would like to keep abreast of what is going on with plans for the new public park next to Voyager Elementary go to the PenMet Parks web site. Is there a tree blocking your view? The best solution is to trim the tree. Take a look at the this recent article from the News Tribune. If it's not your tree, contact the owner of the tree and try and work out a plan to trim the tree. Don't forget that cutting trees and native growth in our development requires approval from our Design Review Committee. Did you know that trees and other vegetation help to stabilize the hill side where your house is located? Read this >>> Slope Stabilization. Want more info, click on this >>> Controlling erosion using vegetation.. Here is another good reference >>> Tree Removal. Change a Life - Be a Mentor. Students in the local school schools could use your help in mentoring in reading and math. Click here. The Members Only area of the web site has a new section called Home Improvement. Check it out. The main water line that feeds the homes in Div 2 split on October 31, 2007. The pipe split at the base of a very large fir tree on the Tripp's property on 101st AvCt. The entire water system had to be shut down from around noon to about 7pm while Pen Light personnel dug about an eight foot hole at the base of the tree. A tree root was the culprit. The root pushed up on the pipe right under the junction of two pipe sections causing it to split. A new pipe section was installed. The tree was removed on Nov 1. There are some photos in the Gallery section of the web site. The 9/5/07 Gateway had an article reporting a cougar sighting in Ray Nash valley. Here is a copy of the article. Be careful and take extra precautions with children and pets and yourself, especially at night. A black bear is one thing but a hungry cougar is something else. Here is an interesting article on black bears in our area by Jim Trainer. Bear and Fawn update: The bear hasn't been seen now for about 3 weeks. The trap was removed last week. What was left of a badly mauled fawn was found a few days ago (Sept 1) at the back of one of the homes on 51st. It could not be confirmed for sure that it was the injured fawn we have been seeing around but it is most likely the same one as there have been no reports of it hobbling around for several days now. Update: The injured fawn has been seen several times today (8/15/07) hobbling along with another fawn and doe. The bear trap now has donuts in it for bait, but no bear yet. Stay tuned. Bear update: A trap was set up yesterday (8/11/07) by Fish & Game in the Bennett's backyard on 98th near which is nearby to where it was discovered that the bear has been spending a lot of time picking a peach tree. The trap is baited with cookies. Instructions from Fish & Game are to stay far from the trap at all times whether it is empty or not. Judging from the size of prints taken on my driveway, the bear is between 100 and 200 lbs. Here is a handy bear to weight chart. The fawn which it is believed was attacked by the bear, was still alive on Thursday when all of this started however, now it is nowhere to be found. If you should spot a fawn with a badly injured leg, please contact Gary Lester or Jerry Gibbs. Bear tracks found today (8/9/07) moving east across Greg Baer's driveway toward 98th and Ray Nash. 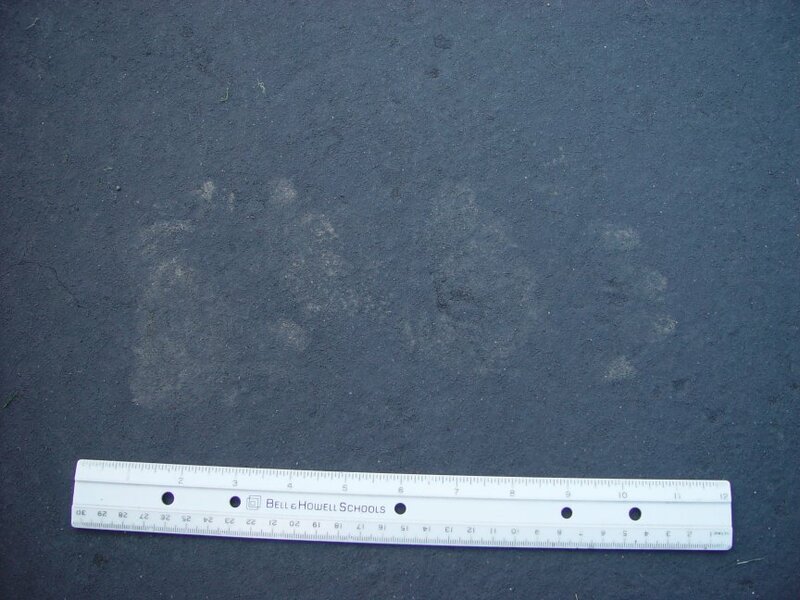 Here is a picture of the tracks Jerry Gibbs found a mutilated fawn in the woodland nearby. Take some extra caution with your small animals and children for the next several days. It was reported that some solicitors are working the neighborhood selling magazine subscriptions. Please discourage this type of activity in our development. Please inform solicitors that our roads are private and such solicitation is not allowed in KRE. READ THIS! >> Access info to the members only area of the web site has changed. Please go to the Contact Information page and fill in the form and click on Send. After your membership and email address are confirmed, you will be sent the new access info. Sorry for the inconvenience. The Contact Information form on the web site has been broken for about a year. Yes, I said a year! Last year all the email addresses on the web site were changed in an effort to foil spammers. It worked. Unfortunately, I missed one address - the one associated with the Contact Info form so it would be mailed out. If you filled it out and never got a response, that's why. It works now. If you fill it out now, you will get a response. 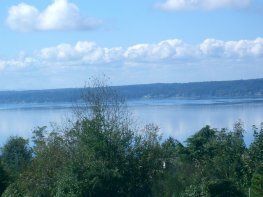 Interested in the new St Anthony's Hospital in Gig Harbor, then click right here. We have a young celebrity in our midst. Jessica Park, daughter of John and Jane Park, on 100th AvCt recently (May 06) won an award at the Intel International Science and Engineering Fair held in Indianapolis. Her project was titled 'The Effects of Electrode Materials on the Effieciency of a Microbial Fuel Cell'. That sounds pretty impressive. This is no small feat to make it from Gig Harbor Hi School all the way to one of the biggest Science Fairs in the world. Jessica won a scholarship from the National Collegiate Inventors & Innovators Alliance (NCIIA) for her efforts. CONGRATULATIONS JESSICA!! Here's a copy of DOT's Transcore newsletter on the Narrows Bridge project. Thank you to Jerry Gibbs for providing this information. The Whittiers report that their car was broken into sometime late Friday night January 6th, 2006. Nothing of value was in the car although some loose keys were taken. Be aware that strangers are passing through our neighborhood late at night. Perhaps they are looking for keys and garage door openers? Everyone should read this news article. Click HERE!